Speak to Erjolf northeast of Rellekka. 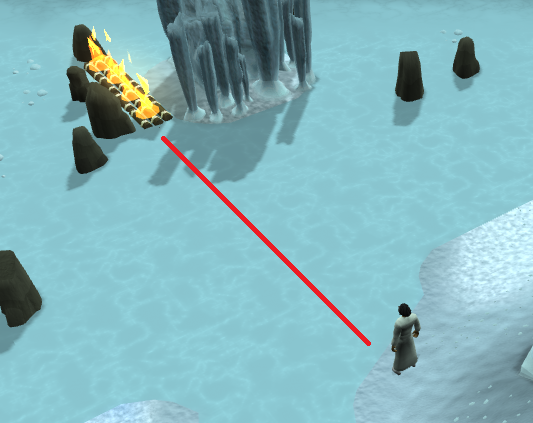 To start this quest, go northeast of Rellekka until you reach the icy mountain. 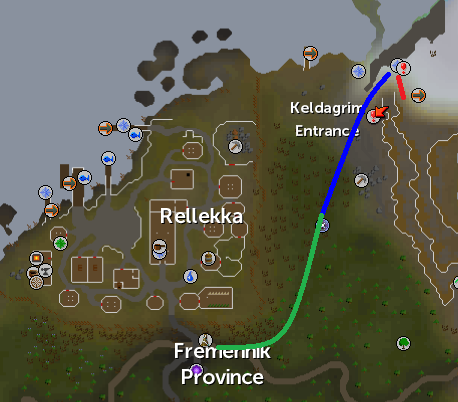 It is recommended that you use the Fairy Ring code DKS to be teleported directly to the quest start point, or use the Fremmenik Province lodestone and walk north-east. Speak to Erjolf, who tells you that he has found something strange in the nearby cave. Agree to keep it a secret and follow him inside. You'll then appear in the cave, with Erjolf on the other side of the river. Click on the flat rock near the water to cross it. Follow Erjolf until you reach the cave opening and enter it. Follow him to the ice block and speak to him. 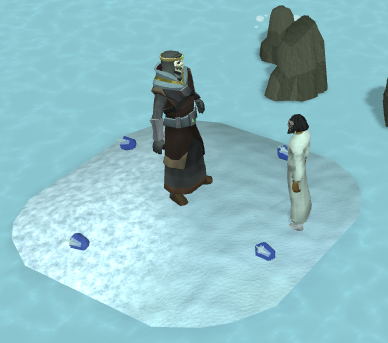 He tells you that there is something in the ice and he needs to get to it to finish the Fremennik Trials. Tell him that maybe you could help him with the Trials. He tells you that he might have an idea how to melt the ice around the armor. Tell him that you are ready to learn how to melt the ice. He tells you about building boats, more specifically rafts, and sending them floating towards the ice, thus melting it with fire. A cut scene will follow, in which he teaches you how to make a raft out of Driftwood. Take about 10 pieces of Driftwood from the nearby piles and use your Knife on them. You can get all the required tools for this part from Erjolf. When you are ready to release a Raft, simply stand near the water and release it. You'll then automatically set fire to the released Rafts. He tells you that the Rafts keep missing their target and there are 4 streams that affect their floating direction. You'll have to block or clear some of them to adjust the flow. To block a stream, use your Spade on the ice mound next to where the water flows out of the cave; use the Spade on the blockage if you want to restore the flow. North stream - This is the only one that feeds the pool (water is flowing towards the middle). West stream - Water flows out of the pool through this stream and any nearby rafts will move towards it until it is blocked. South stream - Water flows out of the pool here. East stream - Same effect as west and south streams. He gives you one final tip: If you release several Rafts at once, they'll come to rest against each other. 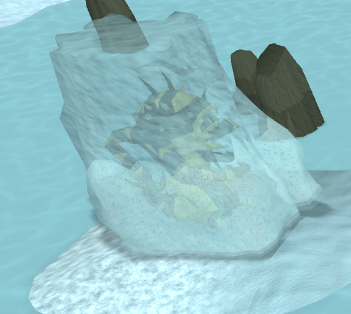 This means you can melt hard to reach ice by releasing several Rafts at once. Remember to speak to Erjolf to get a free Spade, Tinderbox and a Knife. Block the west and east streams. 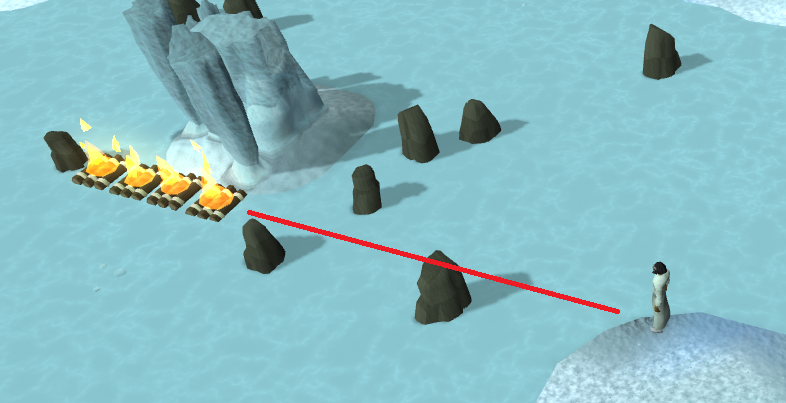 Go north of the ice block, release 4 Rafts from 4 different locations near the water to melt the 4 northern ice columns. While on the same piece of land, release 4 or 5 Rafts one after another. They will follow each other and get stuck behind a rock in the water, melting all of the eastern ice columns. Unblock the west stream and block the south stream. Repeat step 3 while standing in the corner of the land piece that is between south and east streams. Let the Rafts float to the far-away rock, melting all the southern ice columns. Block the west stream and unblock the east stream. Go to the west stream and release 2 Rafts from either side of the western river. Make sure that they are in the water north of you (if standing on the southern side) or south of you (if standing on the northern side). Speak to Erjolf after removing all of the ice and he discovers that it is in fact a frozen monster, not a piece of armor. He wonders why the ice around the monster didn't melt. He suggests you to go talk to a natural historian who is in the area. The historian is located on the Trollweiss Hunter Area, also known as the Snow Hunter Area. Erjolf also asks you to take a look at the creature to describe it to the historian. Go to the Trollweiss Hunter Area, ascend the ice stairs and go to the northeast corner of the area. Speak to the natural historian, ask him if he knows what a yeti looks like, and then ask him if he is any good at identifying creatures. Question: What color is the creature? Question: How many arms does it have? Question: How many legs does it have? Answer: No legs, it's like a snail. Answer: It has spikes which run down its spine. Question: Does it have a tail? Answer: It has a spiky tail, with vicious spines. Question: Describe the creature's hands. Answer: It has pincers, like a crab. He then recognizes the creature but can't tell more than you already know. Ask him how you can find out more about the creature and he tells you that a statue, which had a remarkable similarity to the creature you've described to him, was found in the Kharidian Desert. The statue is located east of the Desert Mining Camp. He gives you a Lumbridge teleport to shorten your trip to the desert. Make sure you bring a Spade. Go to the desert and click on the sand pile while having a Spade in your inventory to clear it from the sand. Ali the Wise will appear and tell you that he was looking for it as well. He asks you to come talk to him to discuss it more. Tell him that you have found a creature that looks exactly like the statue. He tells you that the creature is a Muspah, which is a fearsome predator, combined of various creatures. Ask him why he thinks that the creature you found is a myth. Bring up the topic of clearing the ice from around the Muspah. He will teach you his special ways if you promise to tell him all about your discoveries later (he lives in Nardah). You must bring 4 Cut Sapphires, 4 Cosmic Runes, and 4 Water runes. 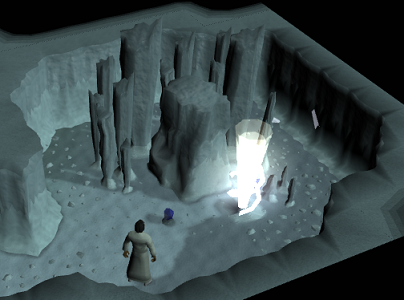 You'll need to use a knife to bore the Sapphires into the ice around the creature, then enchant them using the runes. You can also mine Uncut Sapphires in the new cave but this means you'll need a Pickaxe and a Chisel. You can ask Ali's help to get back to the cave faster and he will give you a Camelot teleport. Head back to the cave and speak to Erjolf. Cross the floating bridge to the frozen Muspah and bore your sapphires into the ice block. Erjolf comes to claim his trophy but the creature suddenly comes to life, frightening Erjolf away. After he runs away, talk to the creature. Make sure you pick up your 4 Sapphires before you leave, as you will need them later on in the quest. After telling it where and what it is, it changes to Jhallan, a Mahjarrat. Talk about all the options and then ask about the ritual of rejuvenation. Ask him what he needs now. He doesn't have power to go into hibernation under the ritual site so he asks for your help. For this you need 4 Sapphires, 4 Cosmic and 4 Water runes, and a Knife. You'll need to find a way to the caves beneath the ritual site. Leave the cave and speak to Erjolf. Ask him how to get to the location and he tells you to meet him on the west coast of the Trollweiss Hunter Area. Bring a Hatchet and speak to him near the fallen log in the hunter area. Craft a canoe and board it. You'll appear in a new area. Enter the cavern near the canoe. Speak to Jhallan who tells you that he is standing directly under the ritual area. He asks you to find a place that is very cold, has no light, no creatures, and no water. The cave has several rooms with creatures, water and light. Rooms with brown floors and walls are not cold enough. Find the room that doesn't have any of these factors. The suitable area is in the southwest corner of the dungeon. Once there, speak to him and ask him if the place is suitable. At first, he refuses to give you a reward but after threatening him, he gives you a Muspah's tail as a trophy for Erjolf. Position your 4 Sapphires around him and then enchant them. Go out of the cave, take your canoe back to the Trollweiss Hunter Area and speak to Erjolf. Antique Lamp - obtained from the Natural Historian. Yields 200 experience to a skill of your choice. 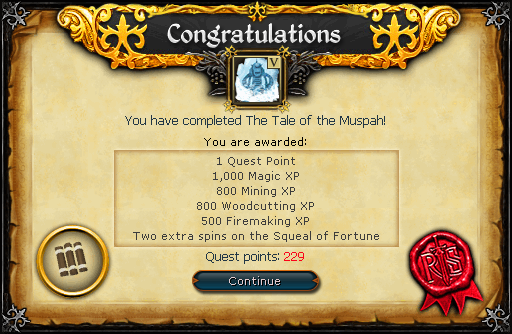 1,000 Magic experience 800 Mining experience 800 Woodcutting experience 500 Firemaking experience 2 spins on the Squeal of Fortune Speak to Ali the Wise in Nardah to learn more about the Mahjarrat. Access to a new dungeon with several Jellies to kill. The ability to mine 8 Sapphire rocks in the cave (can only be done once). [^] Speak to Erjolf northeast of Rellekka. [^] Enter the cave, cross the river and follow Erjolf. [^] Craft Rafts from Driftwood. [^] Follow the steps above to melt the ice. [^] Speak to the natural historian. 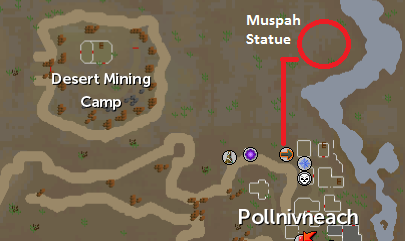 [^] Find the statue east of the Desert Mining Camp. [^] Speak to Ali the Wise to learn how to melt the ice. [^] Melt the ice in the cave, using 4 Sapphires, 4 Cosmic and 4 Water runes. [^] Speak to the Muspah and then to Jhallan. [^] Speak to Erjolf in the cave and then on the Trollweiss Hunter Area. [^] Craft a canoe and board it. [^] Enter the cave and speak to Jhallan. [^] Find a suitable area and perform the ritual. [^] After receiving the trophy, take your canoe back to mainland and speak to Erjolf.